Then I saw this billboard in the streets with a sign: “Looking for Horse Tamers” an advertisement for a new TV show where several teams are challenged to ride fast cars…. As everything in the world around us mirrors our inner selves and because we as a society think it is quite normal to control and tame nature, I cannot help but see that we are controlling and taming our own selves. I also see that there are people who do not support this common idea anymore and are trying to set themselves and the world around them free. The dragon he speaks of is the inner dragon, a strong current within us that can either destroy or create. When we are able to master its energy we can guide it toward creation. From my human perspective I am very confused about freedom and especially in relation to horses… It is hard for me to write a clear message about it, so I will take you further with me on my quest. I believe interacting with horses is not about control, about breaking or taming them. I believe that when we approach them with each of these concepts in our mind we are losing the horse in a lesser or greater degree. In this case we have a fixed idea on how to approach horses and we go toward them with our own devouring inner dragon. We either destroy or control them. But we are not creating together. When we stay fixed in making a horse do what we want, even with greatest ideals and words bore in mind, we are still imposing our human perspective on them. We can say we pray or say we are there for the horse, but are we really? Aren’t we just trying to make the horse do what we want, so they can give us what we want in our human world? Who decided that they needed to adjust anyway? No harmonious, equal relationship can exist when one of the parties goes into authority and dominance. Did anyone ever wonder what horses truly want and start the relationship from there? Isn’t that true freedom, having a choice and then being able to go through with it? I go into meditation and toward the thousands of horses. They are many! I see that they are all coming very close together. They are all pushing against one another about to take off. I am quite surprised. Then I see that a huge herd of horses takes off. Power!! I see the big mass split up into two streams. One stream goes right and one stream goes left. I am closest to the right stream so decide to follow them. They have such a strong pull that I cannot do anything else but follow them… I decided to go in a horse to have the experience and understanding. What about horses with trauma that are in fear or are aggressive? Because these horses choose to get rid of the human as a way to survive most of the time. How can they experience freedom within a relationship with a human? I see a fearful horse, she is very nervous. She moves around all the time. I see her eyes wide open. Then I see how she becomes aggressive and starts biting. I think they mean that aggression and fear go hand in hand. First comes fear and then aggression. I have the feeling they want to say that they already said it with the previous message about traumatised horses. But I ask what about horses that are easily in fear. How can we interact with them? First I see something moving, like a string that moves in a serpent-like manner… The movement doesn’t stop and it is repetitively and soft. Then I see the gears of a car, I see that the gear is brought to another gear. The gear is about adjusting the ratio. The motor doesn’t get overburdened (stressed) because of the gear when it is operating in the right gear. If we would only use our accelerator the motor would completely block or explode. The gear takes away the overload on the motor and reduces the resistance. 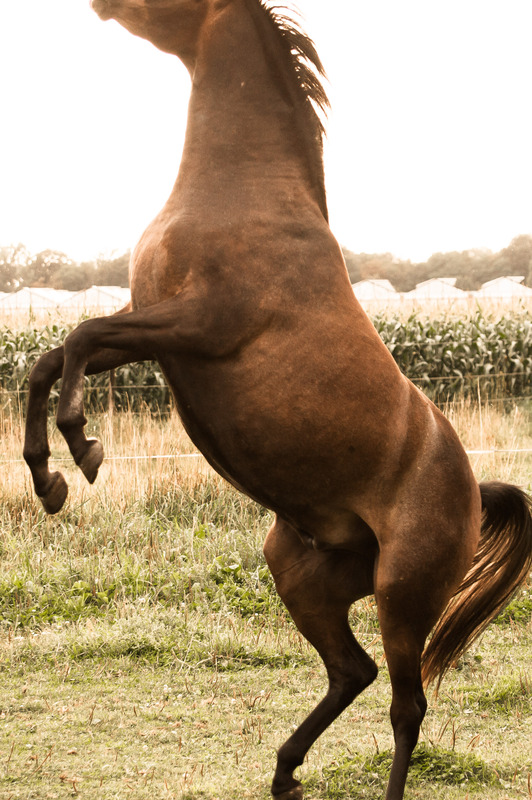 Translated to interacting with a horse: when we bring our horse into movement, we need to be able to dissipate the stress that is brought up in a horse. We also need to start slow, because we cannot go faster than what is possible in relation to the resistance they express. The initial resistance will be huge, but when we can remove the stress we can go to another level with less resistance. When we cannot remove the stress, the horse will completely block or explode.